Popular movie series must always come to an end. 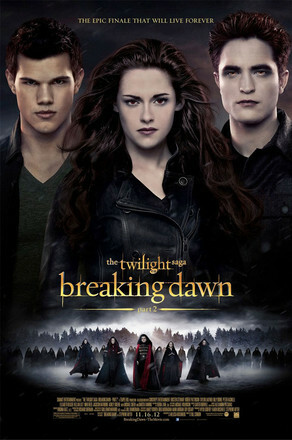 Last year it was Harry Potter and now this year it's the vampire/werewolf flick Twilight. Originally I had laughed at the idea of watching the finale but my friend's talked me into it and I've already seen the previous installments. Today's post will be the final part of the international phenomenon: The Twilight Saga: Breaking Dawn Part 2. The Premise: Continuing after the events of the last movie, Bella (Kristen Stewart) has transformed into a vampire after giving birth to Edward's (Robert Pattinson) child. When the Volturi (the world's most powerful vampire family) discovers the Cullen's secret, Alice (Ashley Greene) foresees them traveling to destroy the Cullens once-and-for-all. The film sets the stage for an intense conclusion and a shocking twist. Breaking Dawn Part 2 was an emotional end to the story. I'm honestly not the biggest Twilight fan but watching the final credits, it felt so touching and nostalgic. Final series ending always get me the most. Overall it was a good movie but not the best. However, I really liked the twist at the end and by the sounds of the theatre audience, they did too. No spoilers if you haven't watched the movie but you will enjoy the surprise. Justin is a longtime TV buff and gamer. He loves chatting about shows, playing video and board games, and his not-so-secret love for reality tv. He is also a fan of horror movies, music and a bookworm at heart. He spends his time in Toronto working in PR and Social Media.